This is a 2011 update of a 1992 book. I read this edition on Kindle. I always enjoy Bebbington on Baptist and Church history. 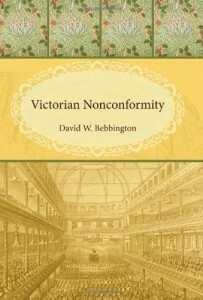 This book explains the reasons for “chapels” in England to be “nonconformist” (or “Dissenters”) during the late nineteenth century, the “Victorian” era. Besides the obvious doctrinal reasons for independent churches to remain apart from the Church of England, there were also denominational reasons among Baptists, Methodists, Congregationalists, as well as Unitarians and Quakers. Interesting also was the popularity that independent congregations enjoyed in that era, due to a great extent to the personal and informal style of worship, especially when the Anglican church was very formal and accepted among the English. As the century drew to a close and other obstacles arose (rationalism, secularism) independent churches were having to choose between popularity and biblical purpose. Some of that popularity had to do with normal progress such as heating or indoor plumbing, but other had to do with the worship itself including music, preaching, and ordinances. Thus the great value in this book for our own generation.